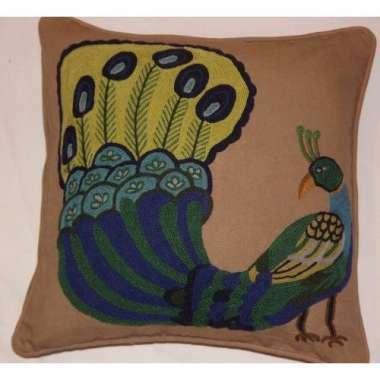 Crewel Pillow peacock design on cotton dyed fabric. The origin of the word crewel is unknown but it is thought to come from an ancient word describing the curl in the staple, the single hair of the wool. Crewel wool has a long staple; it is fine and can be strongly twisted. Modern crewel wool is a fine, 2ply or 1ply yarn available in many different colours. The crewel embroidery or crewelwork is a form of decorative embroidery hand stitched onto a background fabric, which has a hand drawn design first transferred onto the fabric. This design is used as a guide for the worker to work along with a selection of colours of wool threads. This technique is at least one thousand years old. It is used in Jacobean, Bayeux tapestry and also in the Quaker tapestry. The crewel embroidery technique is a particular style of free embroidery. It is usually worked on closely woven background fabric, typically linen or cotton. More recently Crewel is being made on matka silk, cotton velvet, rayon velvet, silk organza, net fabric and also jute. A firm fabric is required to support the weight of the stitching. Special crewel needles or chenille needles are required, with large eyes and sharp points. Crewel design patterns have a wide range from the traditional style to a more contemporary style. The traditional design styles are often referred to as Jacobean embroidery the Jacobean crewel styles often include a beautiful variety of animal patterns with flowing vines and leaves. Crewel fabric is most often used as an Interior Design fabric to create decorative Crewel Pillows, Crewel Panel, Crewel, Crewel Bedding, Crewel Duvet cover, Crewel Bedspreads, Crewel Shams, Crewel Cushion, Crewel runners, Crewel Lampshades, Crewel Quilts and wall hangings.